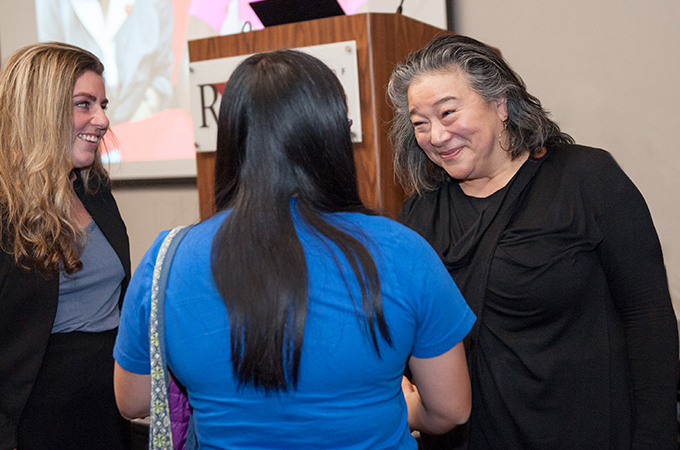 “My road to the White House starts with a refugee story,” said Tina Tchen, former assistant to President Barack Obama and chief of staff to First Lady Michelle Obama, speaking at University of Redlands last week to a crowd of students, faculty, and community members. “Only in this country can you go from one generation’s immigrant story, to their daughter, some 50 years later, arriving back in China on Air Force One representing the First Lady of the United States,” she said. Tchen grew up in Chicago, where her career and perspective were shaped by her involvement in the movement to ratify the Equal Rights Amendment in the 1970s. After graduating from Harvard University and Northwestern Law School, she practiced corporate law for 23 years, during which time she also dabbled in the political sphere. At some point in these activities, she met the Obamas. Images in her slide show—which ranged from whimsical photos of gingerbread houses crafted by White House chefs to shots of intimate gatherings with figures such as actress Meryl Streep and civil rights leader Rep. John Lewis—provided an insider’s perspective of the White House. As Michelle Obama’s chief of staff, Tchen worked on an impressive array of initiatives, including Let’s Move!, It’s On Us, and Let Girls Learn, as well as becoming the executive director of the White House Council on Women and Girls. “Luckily, I was blessed with a boss who knew how to relate to people,” she said. While her White House days are now behind her, Tchen is still working for positive change. As a partner at Buckley Sandler LLP in Chicago, she is currently focusing on helping businesses establish a more equitable culture in the workplace, advocating for equal pay, and highlighting the benefits of diversity. Most recently she was instrumental in establishing the National Women’s Law Center Time’s Up Legal Defense Fund with 300 women working in Hollywood. The fund connects those who experience sexual misconduct in the workplace with legal and public relations assistance. So far, the fund has raised $21 million and has received 3,800 requests for help, largely from low-income workers in 60 different industries. Some 800 lawyers have also stepped forward to provide pro bono work for survivors of sexual harassment and assault.